Awesome set. Good mix of sizes. Grandson will be happy at Christmas. May order more soon! The shipment arrived, it seems OK. But it is a gift for Christmas, not yet tested. Very fast delivery. Latvia reached 12 days. Everything corresponds to the description. Thank you seller. everyone is happy. I recommend! The goods came, well packed, a lot of details .. I like it, the child will be just happy with such a gift)) the track was tracked ..
Lego super, the quality is excellent. 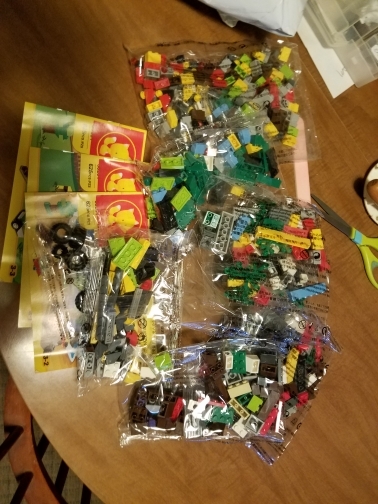 The number of pieces did not count, quite a lot. Packed very well, reliable, nothing broke! But delivery is terribly long. Well, it would still be tracked, but 2 months passed, you need to order in advance, well, at least before ng managed to order to come. Two months it is not clear where the parcel was, and then the tracking began sharply when i opened the dispute, because i was tired of waiting, but immediately the parcel began to be tracked, it reached a week across russia. The seller of course is not to blame for the work of the post office. But of course it's unpleasant. And so-i recommend! La calidad del producto es buena. La razón por la cual compré este paquete en especial es la variedad de piezas que tiene y lo cierto es que no decepciona. Muchos colores y formas, es ideal para los chicos(as). No viene con caja, solo para que lo sepan. Eso si, las piezas vienen separadas por grupos, cada uno en su bolsa. La entrega se produjo antes de lo esperado. Actualizaré luego de navidad. ¡Buena compra! Great quality of this product. The reason why I bought it was the variety of pieces. To be honest, it doesn't disappoint. Pieces come in many colors and shapes. It's ideal for kids. FYI it doesn't come in a box, it's not a problem though since all pieces come in separate groups. Fast shipping. I'll update right after christmas Great producto! The designer is excellent, it was interesting to collect even me a lot of different details, everything is well attached, plus three instructions are quite understandable for a six-year-old child! Thank you seller! Order, you will not regret!!! As described. Arrived fast. Thank you!